This period was the earliest beginnings the interactive information age and we are fortunate that it happened as early as it did. A community of HyperCard developers quickly developed and began creating all sorts of wonderful interactive content including the original Myst. In 1993, a San Diego company called Compton’s New Media won U.S. Patent No. 5,241,671. Their patent described multimedia on a CD-ROM as proprietary, and raised a storm of copyright and multimedia controversy. “Everything that is now multimedia and computer-based utilizes this invention,” Compton’s chief executive Stanley Frank told the San Francisco Chronicle in 1993, Frank noted, of course, that basically everyone in the industry now owed it money. You might imagine Wall Street was delighted, however programmers working around the world were outraged. The problem of “prior art” was quickly solved with a copy of Danny Goodman‘s book “The complete HyperCard” and the patent was revoked. Comptons never gave up the fight and as recently as 2008 an article outlining the controversy continued –Encyclopaedia Britannica [Compton’s parent company] revives notorious multimedia patent, attacks GPS manufacturers. The pointing-finger cursor used for navigating stacks later found its way into the first web browsers, as the hyperlink cursor. 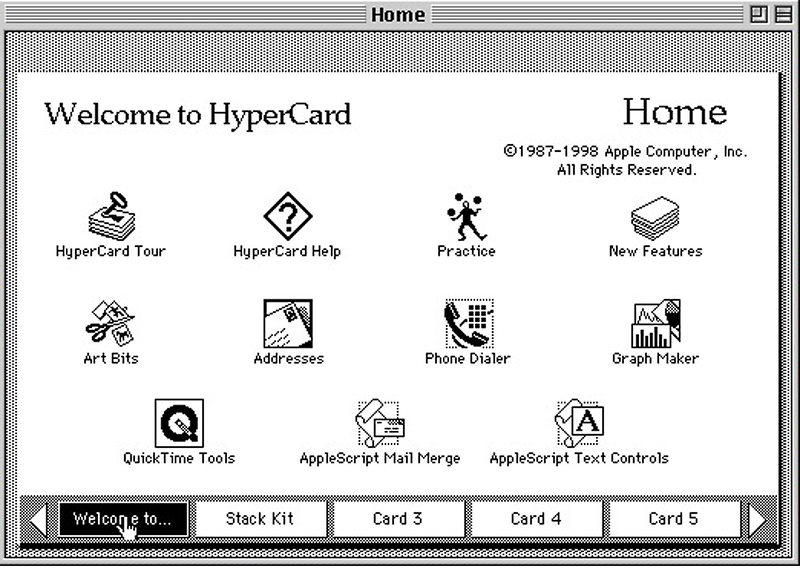 HooPmedia and HyperCard are linked together in this post!